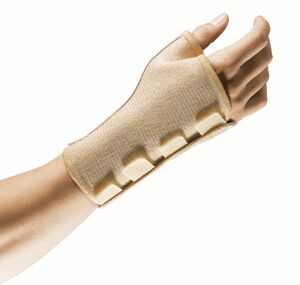 This splint is designed to provide firm support for the thumb and wrist whilst offering high quality material that allows breathability and wearing comfort. Equipped with an aluminum stay, fixed in the ideal angle to limit thumb movement while allowing normal daily functioning. Recommended for use in cases of thumb or wrist strain, sprain, fracture, swelling or inflammation, Trigger Thumb, Bowlers Thumb and Tenosynovitis. Also suitable for use after plaster or cast removal. Fits right or left hand.